•	Voice Dialing Over Bluetooth. •	Application Storage on External Memory, giving users more storage room for all their apps. •	Camera 4-way rotation allows the camera icons to rotate with the camera. 1. Users will receive a notification that Android 2.2 is available for download. 2. Once the user has downloaded the update, they will be prompted to install the update. The user will be notified that their device will be disabled during the installation process. The phone will be ready to use once the process completes. For those who just can’t wait to get Android 2.2, there will be an easy user initiated option to download the upgrade. 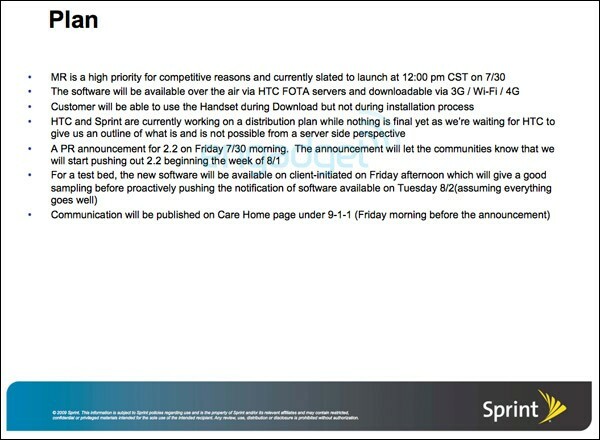 Customers can access the software update through their HTC EVO 4G under the Settings Menu System Updates HTC Software Update. This will initiate the three-step process also. Check out what the top tech reviewers are saying about the device. “It’s actually staggering how different the experience is of using a phone that has over 4 inches of display, diagonally, versus more conventional screens, which run closer to 3.5 inches. Even when you’re using the same OS at the same resolution-in this case, Android 2.1 with HTC’s Sense UI at 800×480, seen on their last few Android phones. Customer favorites on HTC EVO 4G’s long list of features include the 4.3-inch screen, dual 8MP video camera capable of capturing HD quality and front-facing 1.3MP camera. They also appreciate the HDMI output jack making it simple to start a movie for your children in the backseat of the car with the phone and then connect to an HDTV to finish it when you arrive at home.2 Business customers highlight its super-fast 1GHz processor, simultaneous voice and data capability in 4G or Wi-Fi coverage areas enabling Web surfing and more during conversation, and built-in mobile hotspot for up to eight Wi-Fi enabled devices.3 For HTC EVO 4G images visit Sprint’s image gallery. Sprint is the first national carrier offering the next generation of broadband technology today in 43 markets. Sprint 4G delivers download speeds up to 10 times faster than 3G from any other wireless carrier4, giving HTC EVO 4G a faster data speeds than any U.S. wireless device available today. HTC EVO 4G’s exciting features and applications are compelling and powerful in a 3G world, but they become even more amazing when experienced with 4G speeds.